People always postpone hiring a qualified plumber in Santa Ana, CA because they are worried about the cost. Be it a request for a plumbing repair job or a scheduled maintenance, our Santa Ana plumber guarantees to be there in 60 minutes. The last thing we want to do is to go into your home and start destroying walls to get to the pipes. Here at OC Plumbing Pros, we pride ourselves for giving only the best service to our clients in a manner that does not hurt their pockets. Because plumbing issues can happen, whether you like it or not, the challenge is how you will deal with them at the least possible cost to you. Our service vehicles are equipped with all the necessary plumbing tools, plus replacement parts, so our personnel can perform the required service right there and then. When you call us while the problem is still small, we can cut the costs to the minimum. Call us 24/7 at (949) 371-8413. Foolproof Water Heater Installation and Repairs: It is never a laughing matter when your water heater breaks down, especially when you have not even finished your bath yet! Sometimes, all it takes is just a simple repair job. We always strive to cut the expenses without compromising quality of work. Your water heater malfunctioning does not necessarily mean your unit has reached the end of its life. Drain Clogged? 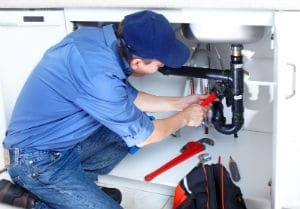 We Can Solve That Problem For You: While the drains are considered important components of plumbing systems, they sometimes end up the least prioritized when it comes to maintenance, and are given attention only when there is already water accumulating in the sink, accompanied by a foul odor. If all the drain-cleaning agents in the market no longer work, we have the perfect equipment to do the job. Rest assured, though, that we know just what to do in cases like this, and because we have access to the most modern tools and equipment, we can ensure flawless solutions to keep the drains open. We do advice that you call us to check your drain before any such problem occurs. Detecting and Repairing Water Leaks: Some leaks, just like slab leaks, for instance, may be hidden somewhere in your Santa Ana property, and they can be difficult to identify, so save yourself the hassle and call on our experts to determine where the leaks are, and make the necessary repairs. Our aim always is to keep the costs for our customers to the minimum. This is why it matters a lot to find out where the leaks are coming from. Be mindful to check your water bills and see if there is a significant increase in the amount due because that can mean there is water leaking around. Emergency Plumber Santa Ana – Call Us Now! Let Us Serve Your Re-piping, Garbage Disposal Repair and Installation Requirements: Our technicians are adept at anything in the plumbing system. Our technicians did complete the necessary training to secure their license. We also have applied for permits and licenses to operate, with the tacit arrangement to be subjected to regulations and oversight from the government. Therefore, give us a call and we will see if your unit can still work just fine after repairing it. Protect Your Family, Repair a Broken Toilet Immediately: A broken toilet can be a health-hazard, too. Of all the DIY projects, homeowners won’t ever touch the toilet even if they want so much to save money. This is why you don’t delay right away. Take confidence in our team because we have the capability to deal with your “toilet” situation immediately, no matter how bad it looks. 24/7 Emergency Services Available At OC Plumbing Pros: You can call us 24 hours a day, seven days a week. Nobody can predict the future, and so you can’t really determine when your plumbing system or toilet breaks down. Every call is processed right away although the estimated arrival time will depend on traffic and distance, of course. Call Our Friendly Customer Representatives for Any Problem Today: We require excellence in all our undertakings, including our customer service. We guarantee an experience like no other when you connect with our Santa Ana plumbers today. Ultimately, you are the only who will decide on which of these options is the best choice. In this case, we can rightly claim that OC Plumbing Pros is synonymous to quality and competitive pricing. Call our plumbing contractors today at (949) 371-8413!